Valued for its restorative and calming properties, basil is commonly used for soothing sore muscles and joints, to ease breathing, and as a cooling agent for the skin. 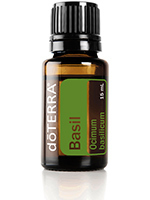 Contains 100% pure therapeutic grade Ocimum basilicum herb oil. Not in stock in our store? You can order doTERRA oils to be directly shipped to you from the warehouse. Would you like to order this at Wholesale price? If you are likely to buy several doTERRA essential oil products, you might like to consider signing up to buy them at wholesale price (25% off). Learn more about buying doTERRA oils at wholesale prices.